Large, south facing penthouse apartment with spectacular views of Chamonix and the Mont Blanc range. 200 yards from the central square of Chamonix and 20 yards from the railway station, from where ski buses to all pistes depart regularly. This apartment has a large dining room and kitchen combined; a master bedroom with double bed and small balcony; a further bedroom with 4 beds (2 in bunk, 1 stow-away); sitting room with double sofa bed and small balcony; bathroom with double wash basin and combined bath/shower; separate loo; large private terrace (size of the entire flat again) and private underground parking for one car. It is equipped with TV, DVD, Broad Band Internet access, UK satellite, dish washer and washing machine. This is a non-smoking apartment. Chamonix is an unbelievable mountain town - not at all like a typical purpose built resort. Steeped in history - from alpine climbing to the Olympics. The apartment is in the centre of the town with dozens of bars and restaurants, discos, shops and the Brevent & Auguille du Midi cable cars. 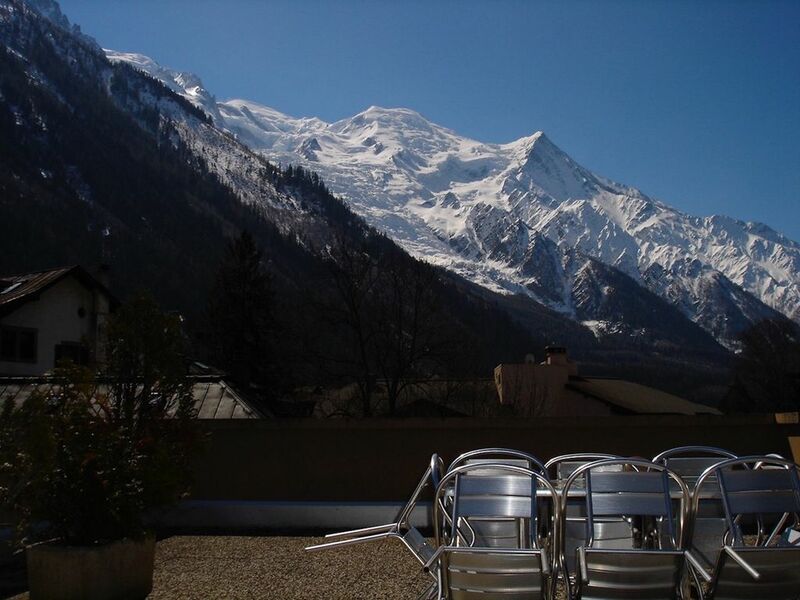 Enjoy awesome views of the Mont Blanc range from the apartment. There's a great mix of ski terrain from town centre blues & reds to some of the best, deepest and steepest off-piste slopes in the World! Geneva airport is a short 60 mile transfer away (easily arranged) or the motorway/ peage virtually runs to the door from Calais for Brits who drive. The central railway station is a 2 minute walk away so you don't even need a car once you're in town. Chamonix is an outstanding venue year-round! Buses to the whole of Chamonix valley leave from the station. Summer details: Chamonix’s a year-round adventure play ground. You can walk, climb (any style to any standard), paraglide, hang glide, parachute (45 minutes away), mountain bike, fish, golf, party, eat, go bowling, swim, play tennis, dance at nightclubs, sight see, break out the water colour paints or gamble at the casino! It is all here for you. Glasses, Cutlery, Plates, Bowls, Saucepans, Frying pans, Kitchen Knives, etc are all provided. The table expands to fit 10 if you want to ask over some friends to share meals. We have enough plates and cutlery for that. The apartment has a large terrace with views over the Mont Blanc massif and up and down the valley. Some of the best skiing in the world. We have ski lockers for storing skis. The apartment has a lift to take people to the fourth floor. The apartment itself has not been specifically adapted for wheelchair users so if you are considering booking please get in touch and we can give you more information. This will help you to assess its suitability for your specific needs. The apartment has four rooms, bathroom and loo. This can be used in a variety of ways. We have it set out as one bedroom (double bed), further bedroom (three beds and stow-away), TV room (double sofa bed) and dining room (kitchen combined) with access to terrace. The terrace is excellent additional living space (twice the size of the apartment) when the sun shines and is equipped with tables and chairs to seat eight people. The apartment is strictly non smoking as this is our home when guests are not staying. If you are a smoker then you will probably want to choose elsewhere. Great place for a Chamonix trip. Bang in centre of town. Well equipped. Car garage space a real bonus. Loved the balconies and views during the afternoon sun. Sky TV and WiFi also well received by all. Thanks John. Perfect chalet-like feel, but in a nice modern building with underground parking. 5 minutes to everything you need, including food, trails, drink and fun. I stayed there as 1 and it felt perfect, even without using the second bedroom with the bunks. Good kitchen, great outdoor patio (charcoal grill was a nice bonus) & overall high marks to chill. Stayed here in October of 2018 and loved it! Super easy location for walking and getting around - Mulet stop right in front of the building and easy walking to bars, restaurants, and grocery. Really comfy beds and perfect layout for a group or family. I can't wait to stay here again! Thanks for the review - hope you come back again soon. Wonderful apartment in the Center of town! We have just returned from a fabulous 11 night stay in Chamonix. John's apartment was perfect for us in every way. Clean, well equipped, warm and welcoming with a spectacular view from every window; furthermore there is a very large roof terrace to sit and enjoy some 'apres ski' surrounded by gorgeous mountain views. We were very fortunate to have enjoyed exceptional amounts of snow this year which made for some superb skiing! The apartment is centrally located with an abundance of bars restaurants and shops literally on the door step. The bus stops close by meant we could access all ski resorts with relative ease. I would have no hesitation in choosing to stay in this apartment again; I wouldn't highly recommend John's apartment, I would specially recommend it! 250 metres from the central square of Chamonix and 100 metres from the railway station, from where ski buses to all pistes depart regularly. Ski: For those who have been to Chamonix before, they will tell you that the off piste skiing is some of the finest in the World, but also there is on piste skiing to suit all levels and abilities. Weekend rates include Friday, Saturday or Sunday. Please note that this is a no smoking apartment. There is a children's cot available free of charge by prior arrangement. TERMS AND CONDITIONS Full payment + £200 security deposit due to confirm all bookings & non refundable if cancelled. Rates include final cleaning & linen - mid-week cleaning by arrangement. Towels only provided by arrangement.